Do you need a free antivirus? You should know that a new alternative has appeared for the well known security solutions Avast Free or AVG Free, we are talking about: ClamWind Antivirus. It is an antivirus specialized in the detection of threats in emails. 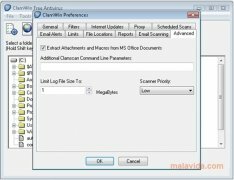 ClamWin Antivirus is a free software project that includes its own scanning engine, focused on the security of personal computers. Thanks to the collaboration of a full community of users, this application manages to improve its efficiency. The use of this antivirus is focused on the detection of threats on demand, this means, detection of viruses and other malicious applications by scanning the files indicated by the user at a given moment in time, because it isn't possible to use it as a shield against viruses that attack the computer in real time. - Detection of the majority of viruses and spyware. - Schedule the analysis of the system and also of the hard drive files. - Integration into context menus.